Bay Area residents are hunkering down this weekend as a powerful storm is expected to wallop the region with gusty wind, heavy rain and possible flooding. Steady rain blanketed most of the Bay Area Saturday, but the heaviest rain and flood potential is expected to come Sunday. A flash flood watch for most of the Bay Area went into effect at 4 p.m. on Saturday and will continue Sunday. 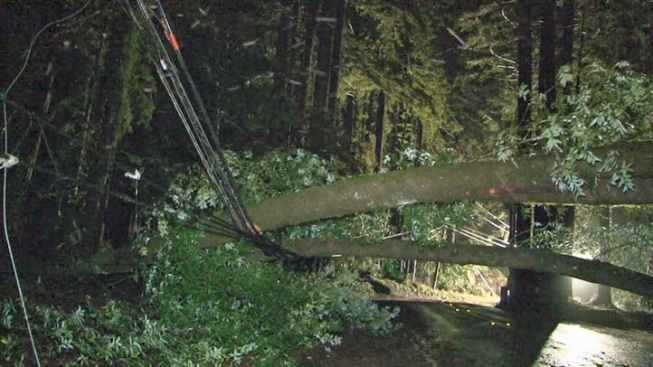 The weather already proved to be deadly on Saturday, where one woman died in a freak accident after she was hit by a falling tree in Contra Costa County. The latest forecast calls for rain totals likely around two to four inches for lower elevations, NBC Bay Area Chief Meteorologist Jeff Ranieri said. Higher elevations of the Santa Cruz Mountains, which already accumulated two inches of rain late Saturday, could see more than six inches of rain this weekend. Rivers, creeks and streams could rise to near flood stage, Ranieri said. Flash flood watches are in effect for every Bay Area county excluding Solano County. The San Lorenzo River in Felton late Saturday was at eight feet. The river in Santa Cruz County on Sunday afternoon is projected to be running 21 feet -- well above flood stage. 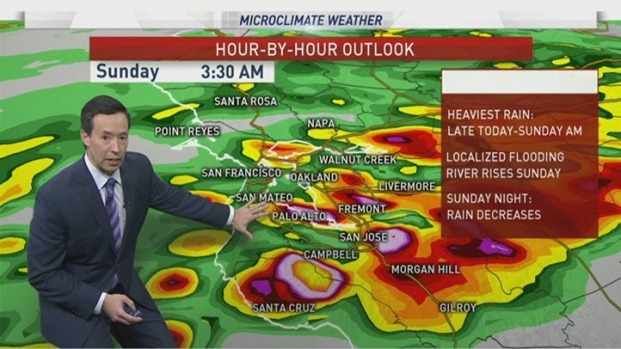 NBC Bay Area meteorologist Rob Mayeda breaks down when most of the intense rain from a powerful storm is expected to touchdown in the Bay Area. In Boulder Creek, homeowners living alongside the San Lorenzo River are keeping an anxious eye on the quickly rising waters. Residents in the area have also stocked up on emergency supplies. In Sonoma County, all eyes are on the Russian River, which is already projected to flood on Sunday. Residents and officials in the North Bay city of Fairfax are also preparing for the worst. 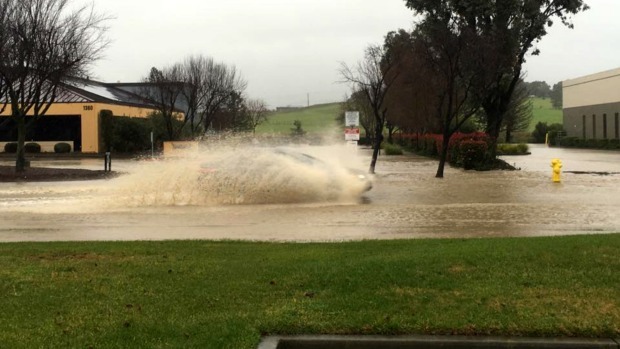 Fairfax Creek, which runs right through town, could flood if the predicted forecast proves to be true. "If all roads lead to what the predictions are, I think the creek is going to over exceed its banks," Fairfax police chief Christopher Morin said. "How bad that is, we don't know." In San Francisco, flood barriers have been set in the area of 17th and Folsom streets to move water away from properties when the big storm moves in. High wind warnings and wind advisories are also in effect across much of the Bay Area. 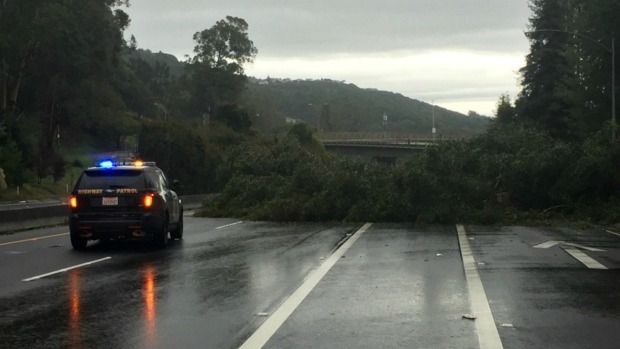 Among a number of other fallen trees around the Bay Area, one such piece of lumber crashed in Oakland Saturday afternoon and blocked all southbound lanes of Highway 13. The combination of blustery conditions and wet weather also put a damper on Bay Area air travel. A total of 226 delays and 72 cancellations were reported at San Francisco International Airport as of 2:45 p.m. Oakland International Airport reported 20 delays and one cancellation.